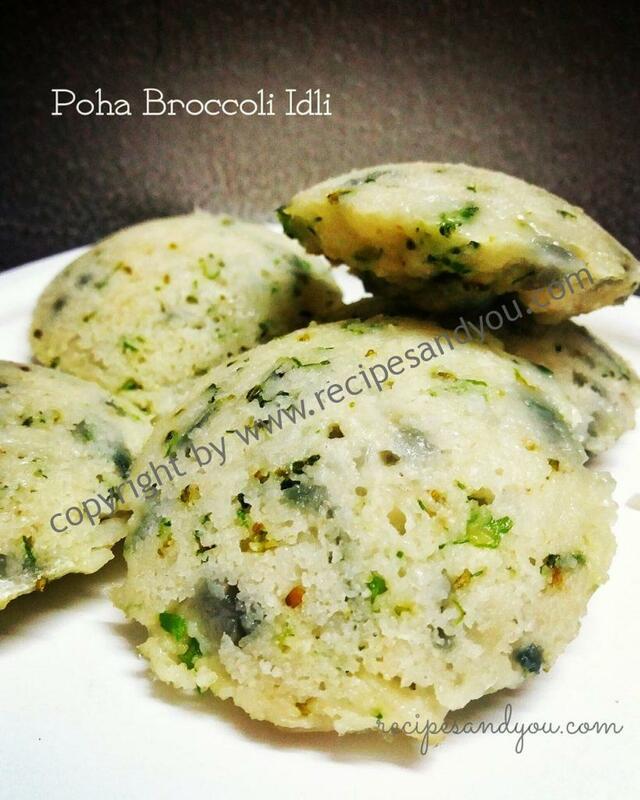 Broccoli Poha Idli | Broccoli Poha Steamed Savory Cakes are a perfect Indian breakfast and snack recipe.Made with chopped broccoli and flattened rice flakes/ beaten rice ,these cakes serve a perfect appetizer, snack and breakfast for you.Its healthy and light and can be served with your favorite sauce/ chutney. A super healthy and super nutritious Super Idli. A quick snack and a delicious meal option.You may prepare this instantly or make ahead if you have time at hand. 3 - 4 tbsp broccoli : florets grated with knife. No stem. 2 tbsp onion chopped -. butter / Ghee grease Clarified to idli mould. 2 tbsp water approx for consistency. Soak the poha in water to make it soft for 5 min. Take sooji ,curd ,soda bi carb in a bowl and mix well. After 5 min drain the poha and add to semolina mix. Add salt,broccoli ,onion and blk pepper (optional) and mix with a spoon .pressing and mashing the poha chunkies nicely. Add water for consistency. Heat water in a idli cooker or kadai to steam Idlis. Grease the idli stand and pou batter. Steam the Idlis at medium heat for 10 min or till done. Serve hot with coconut chutney/gunpowder chutney/mint sauce/ketchup...sauce of your choice. 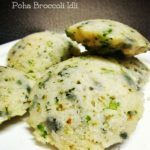 Enjoy this super Idli with your kids. An amazing Kids Tiffin Idea as well. I am writing to you after prepared and shared with some of friends. It was tasty and unique. I would definitely prepare to serve in the future, I have questions regarding the recipe. The recipe asks for 1/2 teaspoon of baking soda/ soda Bi carb for 1/2 cup of semolina and poha. It sounds too much soda. Can you tell me why the recipe calls for so much ? And what will happened if we cut it 50% less. Also ended up using 1/2 – 3/4 cup of more yogurt instead of water to get it porable consistency. I used more yogurt than recommended. Your explanation will help. Thanks. Hi Meera, thanks for writing in. The measurements are based on the types of ingredients used.Like if you use more curd and lessen the soda further ,you will have very dense cakes.Also the softness will compromise a bit.If you still wish to try you may try to check.But the ratio of water:soda:curd is to get the perfect softness of idli.But if you prefer to make it with less soda,you may but the same result may not be achieved.